US Open to Talk About Talks With North Korea - Integration Through Media ....! (VOA): The U.S. is indicating a new willingness to talk with North Korea, but it is still difficult to see a peaceful resolution to the nuclear crisis on the Korean peninsula in the near future. U.S. Secretary of State Rex Tillerson said on Sunday, that he is intent on keeping the channels of communication open with North Korea and is “listening” for an indication that the Kim Jong Un government is “ready to talk.” Bloody nose The shift in tone coming from the administration of President Donald Trump toward supporting unconditional exploratory talks with Pyongyang, and away from talk of a preemptive military “bloody nose” strike against North Korea, has come in response to the Olympic detente negotiated by South Korean President Moon Jae-in. North Korea’s agreement to participate in the PyeongChang Winter Olympics in the South has been accompanied by a pause in its intensive efforts over the last year to develop a nuclear intercontinental ballistic missile (ICBM) that can strike the U.S. mainland. The U.S. contributed to the reduction in tensions by postponing joint military exercises with South Korea until after the Olympics. 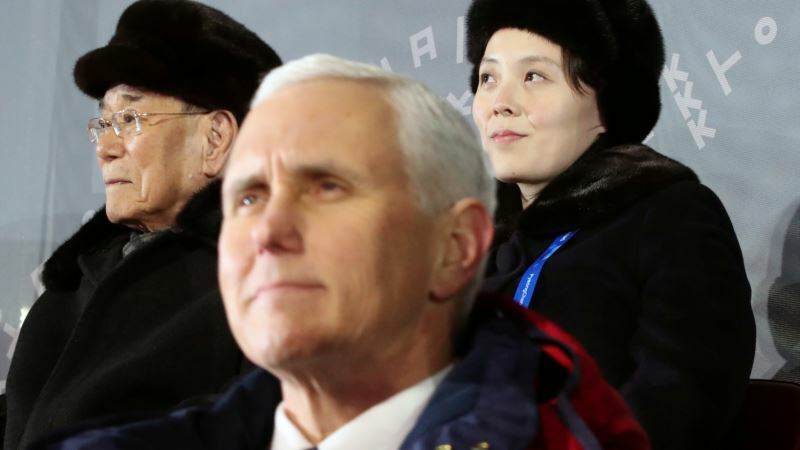 After leading the American Olympic delegation in South Korea, Vice President Mike Pence also stated the U.S. may be open to unconditional informal talks, but emphasized the U.S. would continue to increase sanctions on North Korea until Pyongyang agrees to formal talks to give up its nuclear weapons in exchange for security guarantees and economic aid. Susan Thornton, the acting Assistant Secretary of State for East Asia and the Pacific said last week, during her confirmation hearing in the Senate, that the U.S. has no “bloody nose” military strategy and seeks a diplomatic settlement to end North Korea’s nuclear program but also said that “we will reach this goal one way or another.” Thornton’s testimony seemed to refute reports that Pentagon military planners were preparing for an imminent surgical strike attack on a North Korean missile or nuclear facility as a show of force to intensify pressure on Kim Jong Un to agree to denuclearization talks, known as the “bloody nose strategy.” Critics of the bloody nose strategy say Thornton’s testimony indicates that moderates within the Trump administration have for now put on hold plans for a preventative strike as the risk remains too high that North Korea would launch a deadly counter attack on South Korea that could escalate into a devastating war, and that such unilateral military action would fracture the U.S./South Korean alliance. “I think people began to understand it was going to be a bloody mess strategy and they are moving away from that,” said Frank Jannuzi, an East Asia analyst at the Mansfield Foundation during an interview on VOA’s Washington Talk. Summit conditions Kim Jong Un has responded to Moon’s outreach by inviting the South Korean president to visit Pyongyang for a leaders summit soon. President Moon indicated a willingness to meet with Kim under the right conditions. On Saturday, Moon played down expectations that the summit would happen in the near future and said that he wants to see increased inter-Korean cooperation, and an agreement to discuss the nuclear standoff with the U.S., before a summit can occur. “I expect the relations between South and North Korea to improve in the future. Meanwhile, a shared understanding to have talks between the United States and North Korea is growing. I hope the inter-Korean talks could lead to talks between U.S. and North Korea and also denuclearization talks," said Moon. Under Kim Jong Un, North Korea has declared itself a nuclear weapons state and has repeatedly refused to talk about giving up what it claims is needed deterrence to prevent a U.S. invasion. The U.S., meanwhile, is unwilling to ease economic sanctions pressure until the Kim government agrees to the goal of denuclearization. Moon’s diplomatic efforts are aimed at finding a way to get Pyongyang and Washington in direct talks, despite these opposing stances. “I don’t think the North is really prepared to talk about nuclear issues with South Korea, but South Korea could help facilitate that process getting underway,” said Robert Einhorn, a senior fellow for the Arms Control and Non-Proliferation Initiative at the Brookings Institution, during an interview on VOA’s Washington Talk. However President Moon’s ability to offer North Korea significant economic incentives to encourage compromise and cooperation is constrained by international sanctions, and the U.S. maximum pressure approach. And time for Moon’s Olympic diplomacy could run out in April, when the U.S. and South Korea are expected to resume joint military exercises. Washington defends these conventional drills as legal under international law and needed to maintain military readiness. But Pyongyang has called them provocative rehearsals for invasion, and could respond by resuming missile or nuclear tests, which could reignite tensions in the region.